Do you remember when QR codes were the big thing in advertising? It seemed almost impossible to get anything, even a bag from McDonald’s, without that futuristic-looking barcode on it somewhere. It was the perfect way for companies to draw people to their websites all while making them feel like they were witnessing magic take place before their very eyes. I feel like QR codes these days are similar to selfie sticks – it takes a very special person (or company) to use them without looking completely foolish. Unlike selfie sticks, however, the use of QR codes seems to be dwindling. Why did this happen and what can we, people stuck in a whirlwind of ever-changing marketing tactics and technology, learn from it? The first QR code was, unsurprisingly, designed with efficiency in mind– it was created and used by Toyota subsidiary Denso Wave to help in their manufacturing process in 1994. Its efficiency benefits were astounding, and eventually QR codes were being used by companies all over the world. As smartphones become more widespread, Japan introduced QR-code scanning capabilities onto their phones in 2002, but it wasn’t until 2010 that QR code scanner applications on phones became widespread. 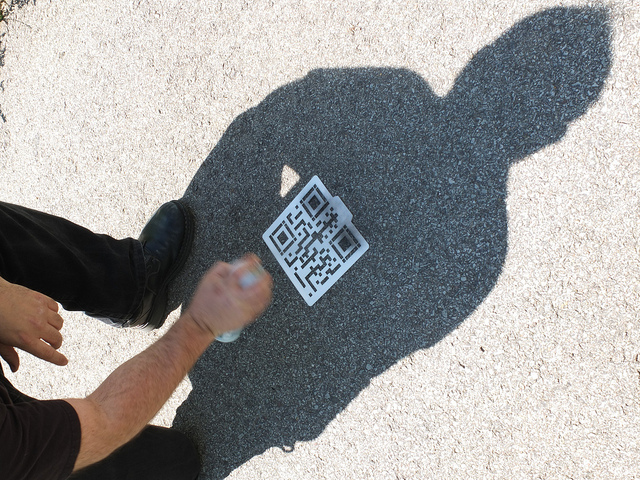 What will encourage someone to scan a QR code? Giving something away for free, of course! Taco Bell used QR codes on their food packaging to encourage customers to download free songs as part of a music campaign, and they had great success with it. The campaign generated 400,000 scans in six weeks. QR codes additionally found success when offering individuals a way to add more to an experience. THQ Homefront, for example, placed QR codes throughout their video game and allowed players to view exclusive content. The campaign was incredibly successful – so much so that people even put together videos of where to find all of them. The Taco Bell and THQ Homefront campaigns give away another obvious indicator of QR code success: they are best used for a tech-savvy, younger generation with more leisure time. QR codes also work better when used for promotional or giveaway purposes instead of linking to an informational site. Have you ever received an email with a QR code at the bottom? It’s a perfect example of plopping something trendy into a message without thinking about how it’s actually used (after all – why would you use your phone to scan something that’s already online?). As QR codes became more popular, companies seemed to be using them just for the sake of jumping on the bandwagon. One of the worst assumptions that businesses made when using QR codes is that they could swap a code out for important marketing content and expect that the same amount of people would successfully receive the message. This isn’t the case, mostly because people do not want to install a code-scanning app on their phones – they either don’t want to take up space, or they are in too much of a hurry to stop and download it. This becomes even more of an issue in areas without free wifi. Add poor location into the equation, such as a code high up on a building or in an area with a lot of foot traffic, and people will find it impossible to even scan it properly. At the height of the QR code trend, companies seemed to forget a key factor in determining marketing success: ensuring that they were reaching the intended audience. If you want to target thirty-something business professionals, for example, placing a code in the middle of a subway station in a major metropolitan area may seem like a good idea – but are those busy professionals really going to stop to take a picture, or do they have other places to be? Is a QR code on the box of a children’s toy a good way to promote to parents, or is the box going to be immediately tossed as soon as the child has the toy in his or her hands? Here’s another good one: would you really want to be caught scanning the back of someone’s shirt while waiting for your sandwich? If these kinds of questions were asked, companies may have saved money (and their reputation) and chosen other ways to reach their audiences instead. Is this tactic relevant to my target audience? Have I educated myself enough in this to use it properly? How have other industry experts used this, and with what results? Will this actually help my business increase revenue, or is the true purpose to just prove we are staying trendy? Am I willing to dedicate more time to a new, but uncertain, method of marketing, only to put other successful tactics on the back burner? The next time you see a QR code, be sure to give it proper thanks. It will, after all, remind you to look beyond marketing fads and focus on what is best for you and your company. Success is all about having a great team of experts – our Midwest Direct team can help you bring your marketing strategies to life! Contact us to learn more.